Lent is a great time to teach young children about Christ, our Good Shepherd. Here’s how. Lent is a great time to talk about Jesus as Good Shepherd with young children. “The Good Shepherd lays down his life for his sheep” is a verse that helps them begin to understand what happens in Holy Week. But what exactly is a shepherd? What does it mean to lay down your life for the sheep? Twenty-first century children need help with these concepts. Children’s books are a great way to introduce them. 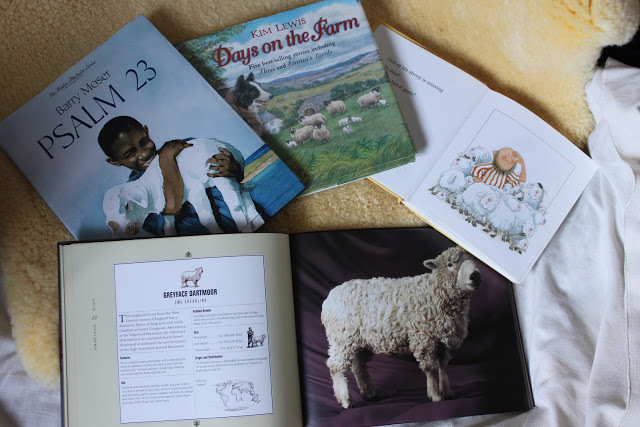 Today, we’re republishing a post from Emily Grace Watkins’ blog, with her permission, suggesting Good Shepherd children’s books for your family Lent. The original post is here. -Ed. There are always stacks of books on every surface in our house. Sometimes I sigh–my house will never be tidy–but overall I’m glad. Most of the time the stacks are rather random, but with each season change or, if we are studying something in particular, I always position a stack of books that will be easy for little ones to find and explore. Here are some of our favorites for our time with the Good Shepherd story. 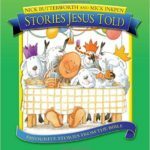 Stories Jesus Told by Nick Inkpen and Mick Butterworth: This book is a must have for any toddler (and I don’t say that lightly). It is a collection of simply told parables that are great to read aloud. The tale of the lost sheep is perfect for a wee one and is fun to read over and over (and you will be reading it over-and-over if my boys are any indication). Beautiful Sheep: Having grown up on a sheep farm, I have a special affinity for our wooly friends and all things wool. I want my boys to understand that sheep aren’t just sheep. Heavens no! Spunky, hard-hooved, ugly cheviots (sorry I have a grudge) aren’t anything like stalky, dense, and oh-so-cute southdowns (I had my own flock of southdowns growing up.) Jim’s aunt sent me this book and it is a treasure. This collection of portraits of various sheep breeds is just fun to flip through. 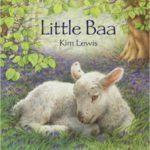 Little Baa by Kim Lewis: I love Kim Lewis’ books. The rolling hills, sheep and simple stories are lovely for little ones and remind me of my childhood. Little Baa is my all time favorite; the story of a little lamb who gets lost from his mother and the shepherd helps him find her. 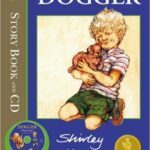 Dogger: Okay, so there is nothing about sheep in this book, but it is a treasure of a book about a precious animal lost and found. The story is beautiful and helps a child enter into what it means to lose something that means so much. 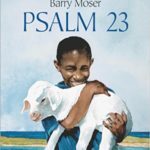 Psalm 23 by Barry Moser: I’ve looked at several Psalm 23 books and I think that this one is my favorite (at least for right now). The shepherd is a small boy and the watercolors are soothing and clear. 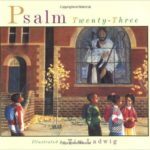 Psalm Twenty-Three by Tim Ladwig: The words of the 23rd Psalm are placed over illustrations of small children in a city, showing God’s care in a modern setting. 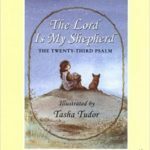 The Lord is My Shepherd by Tasha Tudor: I read lots of Tasha Tudor as a girl and while I don’t feel the illustrations have the depth that the two listed above have, it is such a pretty little book! I have this in a tiny book – just right for on our godly play shelves right beside Tasha Tudor’s Lord’s Prayer and the Prayer Book. Tig and Tag books by Benedict Blathwayt : These books are fun and I love the English countryside in Blathewaits work. I have picked up a couple at charity shops and would recommend picking them up used if you come by them. 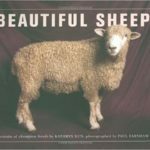 Any other shepherd/sheep/lost-and-found books you would recommend?